Update: New art added February 21, 2013. 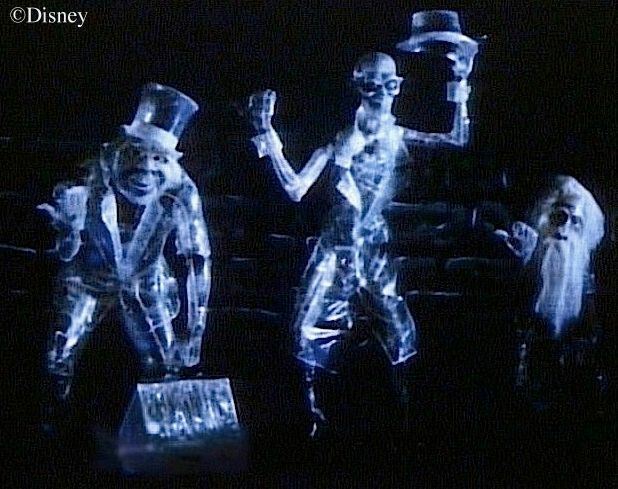 As we've said before, the Imagineers responsible for creating the Haunted Mansion scoured the nooks and crannies of popular culture looking for ideas, reading ghost stories, looking at spooky films, and even thumbing through old comic books. A number of inspirations—possible, probable, and nearly certain—have surfaced in our searches for these sources. 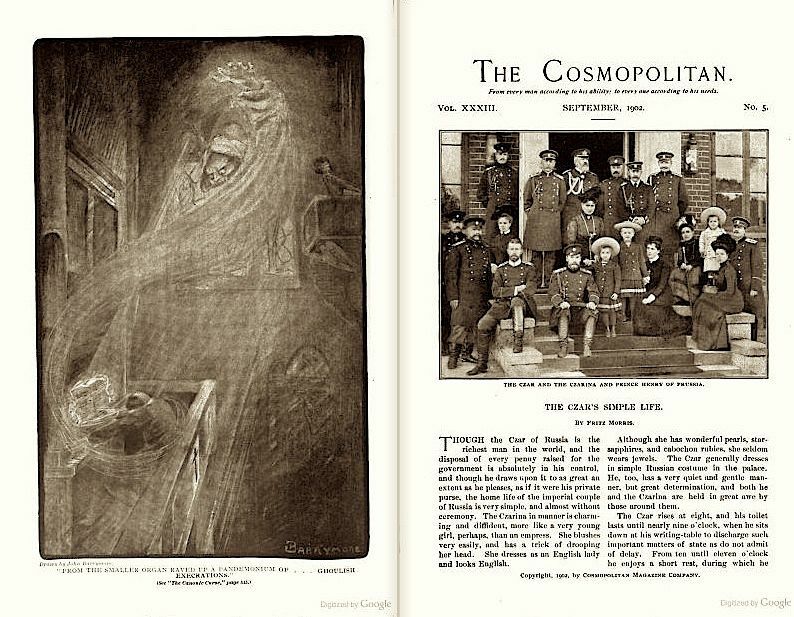 They're always interesting, because they enable us to retrace the creative process to some degree as well as connect the Mansion to the larger world of images and ideas within the human experience of the supernatural and the uncanny. Besides, it's just plain fun, and that's that. One of our regular readers, and a solid HM fan, is Craig Conley, a prolific author and an astoundingly voracious reader. During his perusals of old journals and other forgotten literature, he's come across a pair of possible sources of inspiration for things in the Mansion and kindly brought them to my attention. And so, with our thanks to Mr. C, let's take a look. It's an illustration for a short story, "The Canonic Curse," by Arthur E.
"The Canonic Curse" is a better than average supernatural thriller about a demonic, medieval musical composition that has a rather nasty effect on anyone who plays it three times. You can read the whole thing HERE. 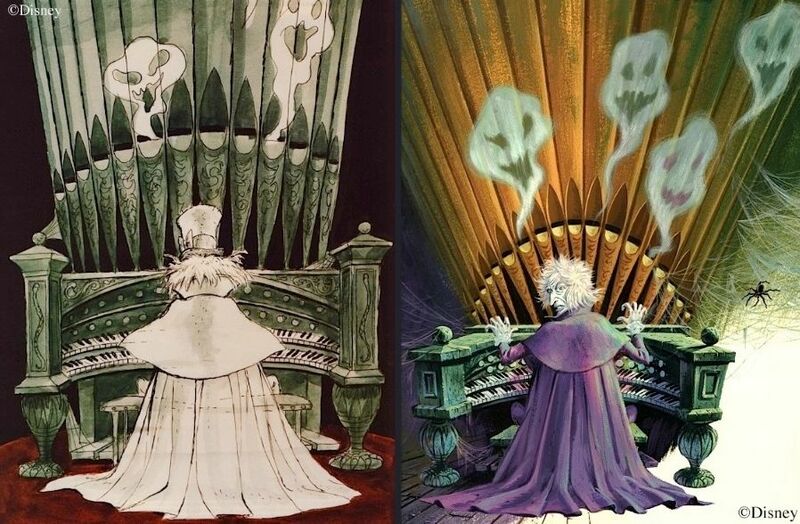 However, there's nothing in the story that looks to me like a direct inspiration for the Haunted Mansion's ghost-infested organ. 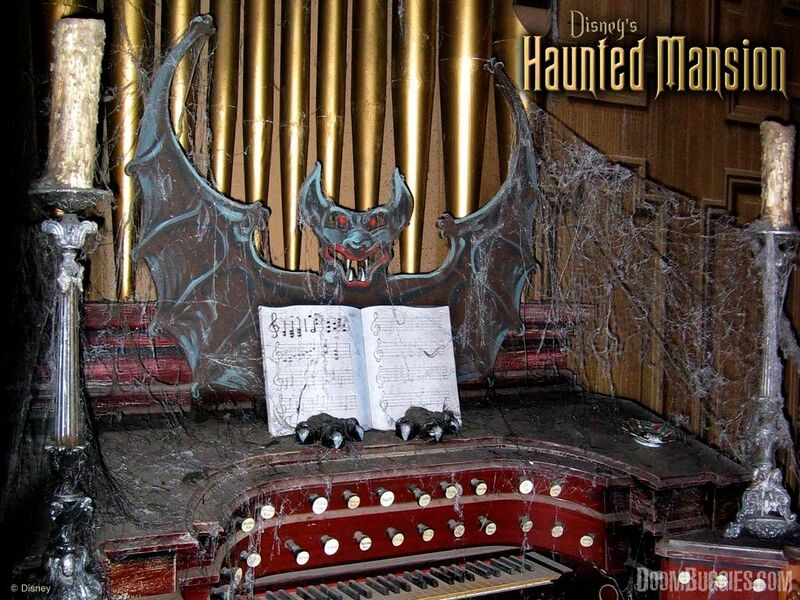 For one thing, it's not the organ but the musical score that's demonic. 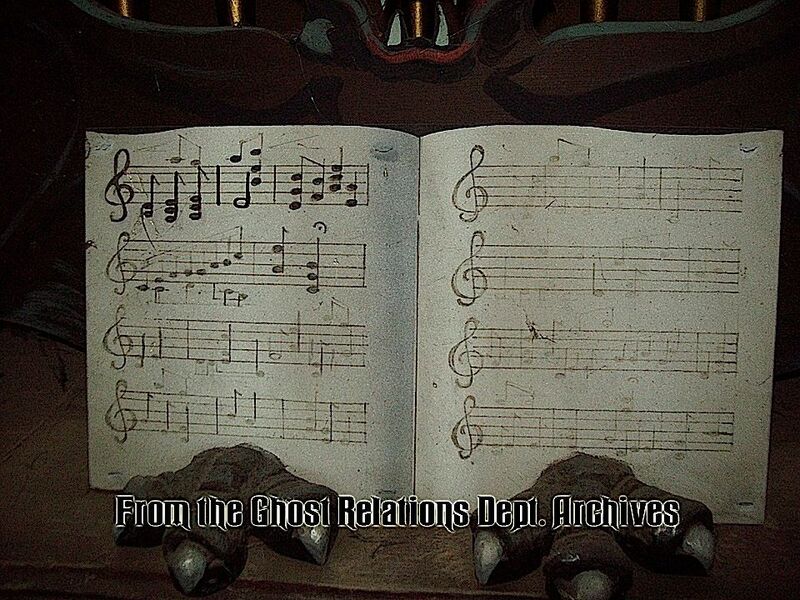 For another, no visible ghostly forms emerge from either the sheet music or the organ in the story itself. 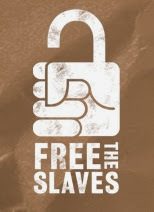 If there's a HM inspiration, it's more likely coming from the illustration above rather than from the actual tale. 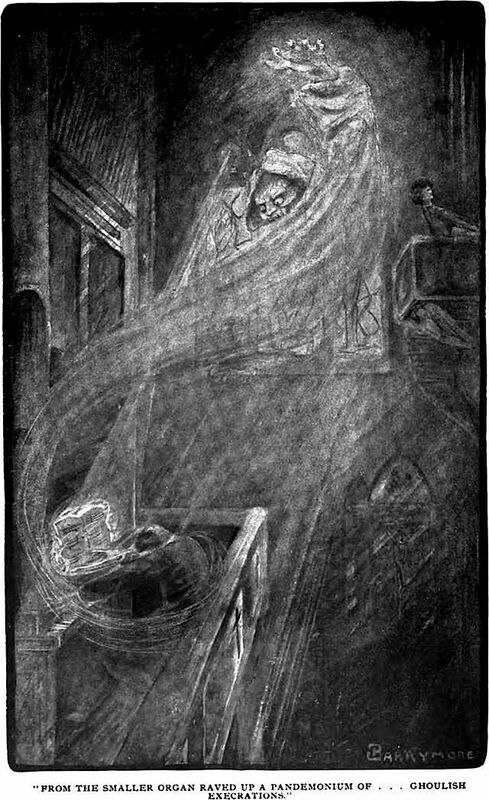 The sketch shows a ghostly figure emerging from the musical text, but without looking closely the figure could easily be read as coming from the organ. (Frankly, it's not a great drawing.) 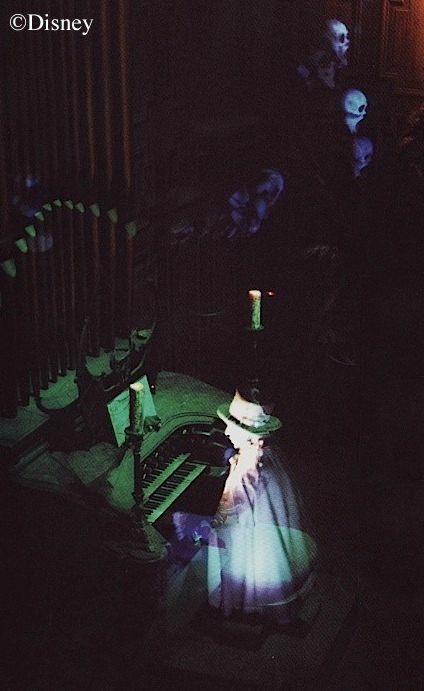 And the caption reads, "From the smaller organ raved up a pandemonium of...ghoulish execrations." 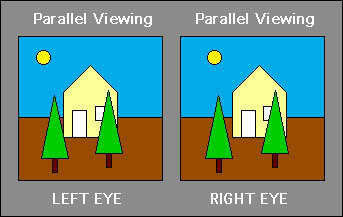 (There are two organs in the room.) 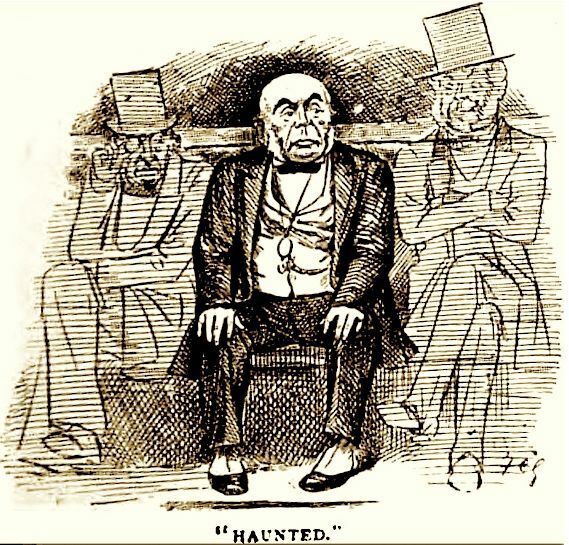 In the story, the "ghoulish execrations" are sinister presences in the form of sound, but the illustrator has to draw something to represent that. 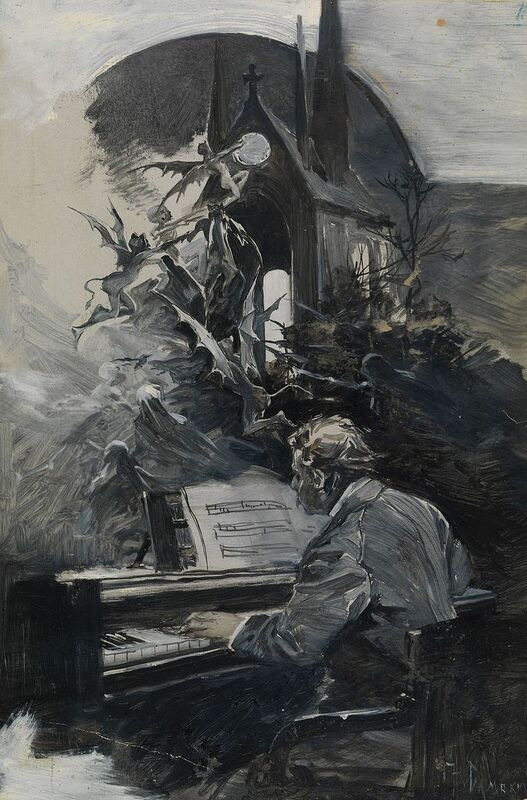 Whether or not Marc Davis or one of the others saw this sketch, it is the only depiction I have seen of an organ spewing out spirits as it is played. But hold on a sec. "The Canonic Curse" sends me back to the ballroom for a fresh look. For some stupid reason, it never occurred to me to think of the musical composition as the thing that actually summons the banshees up and out of the pipes. The tune grows more frenzied as it sails along and disintegrates into a mad improvisation as it reaches its climax. It's as if the music were the thing compelling them to appear. 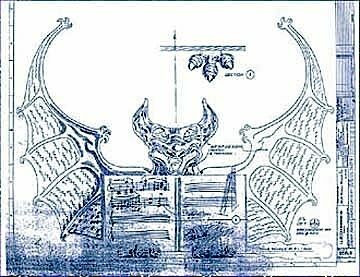 So if we were to conclude that the musical score is the key that unlocks the ghost-infested organ, the storyline of "The Canonic Curse" might be relevant after all, as well as the illustration. 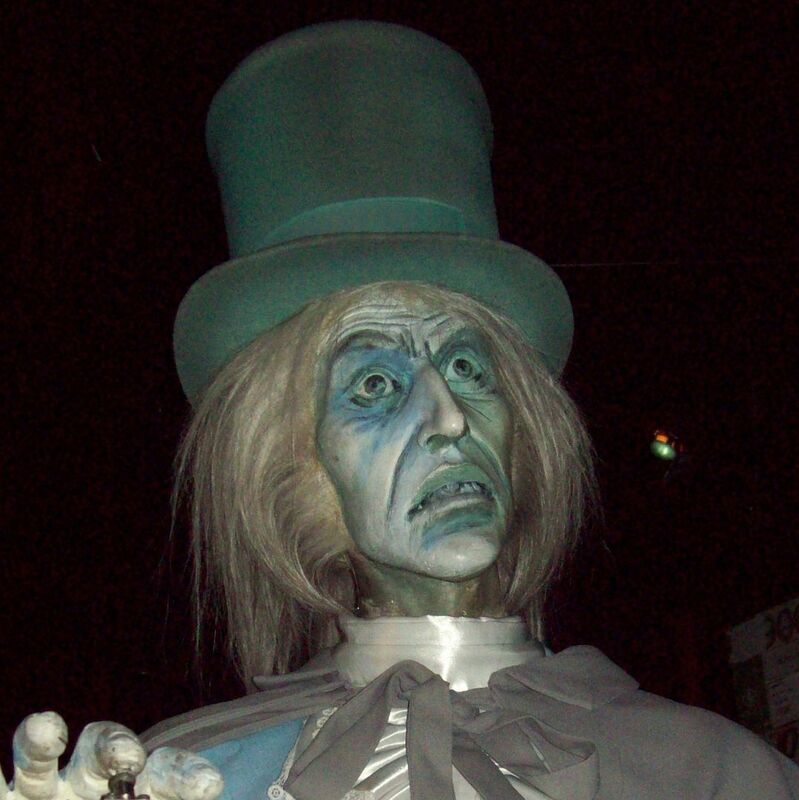 Whatever the case may be, I think Conley has brought forward a respectable candidate as a possible source of inspiration for the Haunted Mansion. 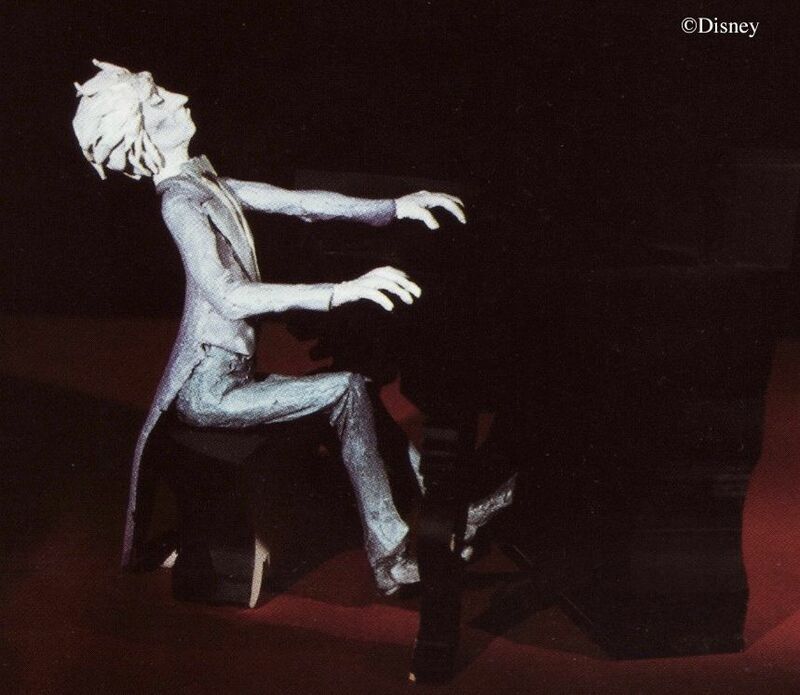 By the way, the seldom-seen maquette figure of the organist, used in the scale model, isn't really the wild-haired crazy man that you see in Marc Davis and Collin Campbell artwork. Curiously enough, he's more of a thin, haughty, Liberace-type of guy. you can hardly see any part of his face, it doesn't matter that much. "What do you mean, 'It doesn't matter that much'?" Here's that famous trio, already in place and thumbing for a ride even before the Mansion opened, in the summer of 1969. This isn't the Disney version, obviously. 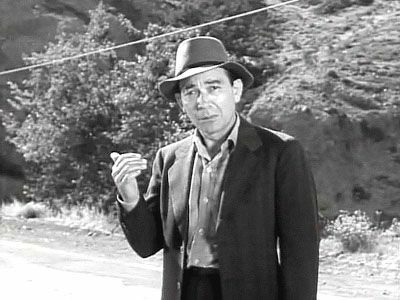 The idea of being followed by a hitchhiker who gives you the creeps and whom you do NOT want to pick up is a less-frequent variety, but it's there. Once again we are indebted to Brandon "GRD" Champlin, who stumbled across an interesting example and posted it at his now-defunct blogsite. (You can still read the original post HERE.) 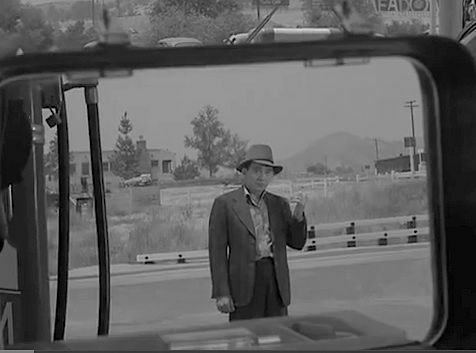 In a 1960 episode of the Twilight Zone ("The Hitchhiker"), a young woman driving from New York to California keeps seeing the same hitchhiker. Finally, she can't stand it and stops to call home to mother. 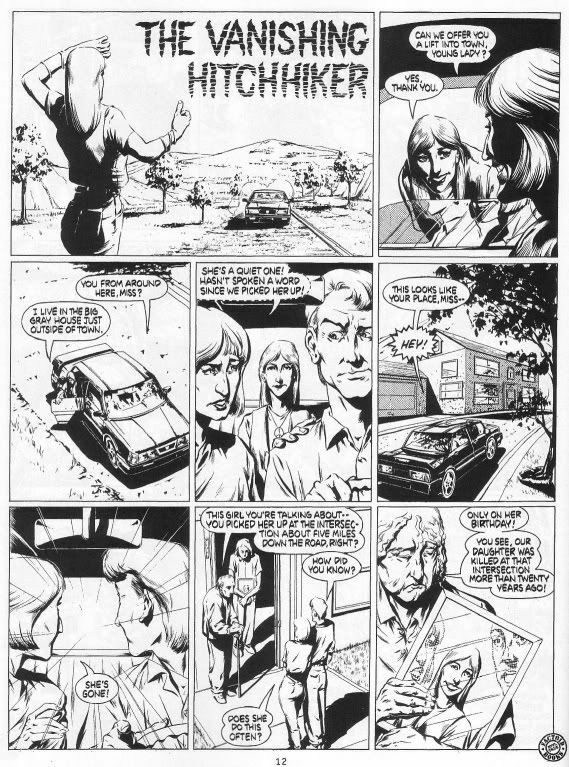 Another woman answers and explains that the mother is recovering from a nervous breakdown, having learned that her daughter died in an auto accident six days earlier (deedle deedle deedle deedle). The woman who delivers the bad news, incidentally, is none other than Eleanor Audley, voice of Madame Leota (deedle deedle deedle deedle again). 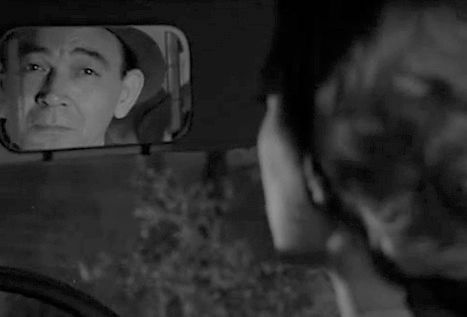 ...and the second time, he's sitting invisibly in the car with her! carriage seat. Even if it isn't, the similarity to the ghost-in-the-mirror gag is plain. source of inspiration contributing a few ingredients to the finished recipe, but we'll probably never know. 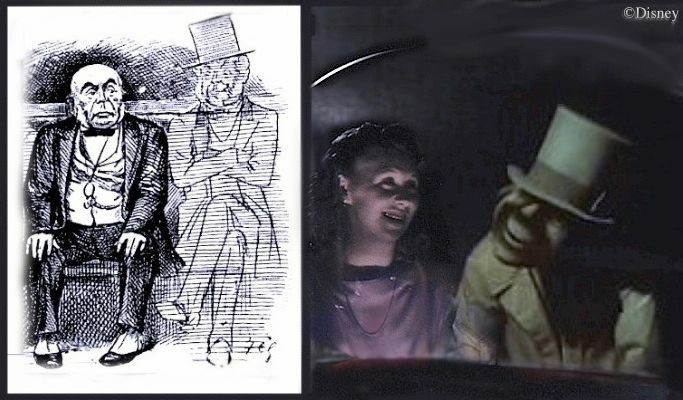 Needless to say, the new CG hitchhikers at WDW take their inspiration from different sources altogether.